The former takeover titan is now a brand builder - and maybe even the shareholder's new best friend. Fortune's Shawn Tully reports. (Fortune Magazine) -- In March 2006 power investor Nelson Peltz invited Heinz CEO Bill Johnson to dinner at Morton's Steakhouse in West Palm Beach. After the two men sat down, Peltz stunned Johnson with an in-your-face barrage, announcing that "I'm going on your board!" Peltz, whose Trian Group controlled 5.4 percent of Heinz shares, then lectured Johnson on his recipe for reviving Heinz, from ditching hard-to-open ketchup packets to multiplying the ad budget. "We disagreed," recalls Johnson of the bruising encounter. "It wasn't a cordial meeting." 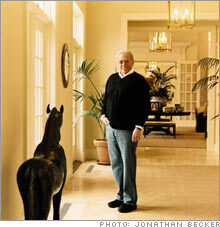 Peltz owns sumptuous estates in Bedford, N.Y., and Palm Beach. 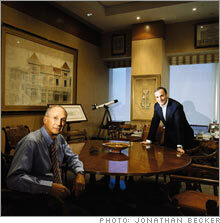 Peltz relies on the counsel of longtime partner May (left) and son-in-law Ed Garden. 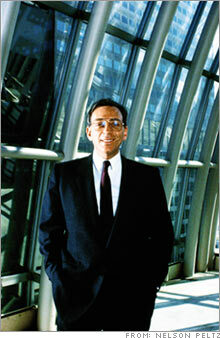 Young man in a hurry: Peltz in 1986. In February of this year, the two men dined again, and this time the atmosphere was quite different. Peltz invited Johnson and his wife, Susie, to his palatial 15-acre estate in Palm Beach, one of the most expensive private homes in America. The Johnsons admired their host's collection of French Empire antiques and museum-quality Impressionist paintings, and enjoyed cocktails in the spectacular loggia overlooking the Atlantic featuring glass walls that rise from the basement to keep out the rain. "We talked that evening about how to build longterm value," says Peltz. "You must make some decisions Wall Street dislikes. I'll help give Bill the cover to make those decisions." What accounted for the dramatic change in tone? That's easy. During the 11 months between dinners, Peltz won two seats on the board - and the hearts and minds of Heinz executives with the power of his ideas, especially a massive marketing push to get customers excited about ketchup. Since Peltz launched his campaign a year ago, Heinz (Charts) stock has jumped 34 percent, to $45, putting almost $4 billion in shareholders' pockets. "The form of activism he's practicing is legitimate," says Heinz's lead director, Tom Usher, the retired CEO of U.S. Steel. "He's been a positive force at Heinz." Indeed, Nelson Peltz is a force of nature - and one of the more compelling characters on the business stage today. He's worked his magic at Snapple and Wendy's (Charts) as well as Heinz - and in a move announced just days ago, he's set his sights on the world's largest confectionery company, Cadbury Schweppes (Charts) (to which he sold Snapple in 2000). Silver-haired at 64, with a gravelly baritone and sharp features, he remains relentlessly competitive - whether he's tangling with corporate boards or cheering on his brood of hockey-playing sons. A college dropout who went to work driving trucks for his father's food-distribution business, he lives in baronial splendor on two of the most luxurious estates in the land. Since launching his empire in the 1980s with the help of Michael Milken's junk bonds, Peltz has suffered through censure by the London Stock Exchange and the collapse of a big British real estate company he ran in the early 1990s, and he's won the scorn of corporate watchdogs for his compensation. So far, we could be talking about any of a dozen Wall Street operators. But Peltz stands apart from the pack. He is the antithesis of fast-moving raiders like Carl Icahn and Ron Perelman. His goal isn't to grab a quick buck by forcing targets to overleverage their balance sheets to pay for huge share buybacks or special dividends - it's to build value through improving operations. Unlike voracious private-equity firms, he plies his trade in the public markets, where ordinary investors can share the gains. "Increasingly, stockholders are tiring of private equity stealing companies from under their noses," claims Chris Young, a vice president of ISS, the proxy advisory service. "Peltz is doing the same thing that private equity does, only for the public shareholders." Nelson Peltz as the shareholder's best friend? It may sound far-fetched, but he's making an intriguing case for that title. Peltz calls his formula "operational activism." He defines it as working the managements of high-potential but underachieving companies, like Heinz, to raise earnings by paring overhead, shedding ancillary businesses, and most of all, burnishing famous brands. The good thing about private equity, says Peltz, is that "it's up-close and personal. The CEO talks to the owner every day, not once a quarter." He aims to recreate the pressure exerted by private equity in public companies: "We say, 'Keep the company public and force managers to break a sweat, but without the excessive leverage imposed by private equity.' Raising $1 by issuing new debt is worth $1. But if I can raise earnings by $1, that translates into $10 to $15 in value. Guess which is better?" It's a tricky task, since Peltz is neither the full owner nor the CEO but works as a board member or through directors who are allies. But his approach does offer him some major advantages. Unlike private equity firms that purchase entire companies at a premium, he can buy blocks of stock without driving up the price. He also avoids the bidding wars that are inflating those premiums - witness the huge, auction-driven price Blackstone is paying for Equity Office Properties. Best of all, Peltz faces relatively little competition in his niche. "A lot of people can do financial engineering," says Jerry W. Levin, the former CEO of Burger King who now runs the brand consulting group JW Levin Partners. "Far fewer can improve operations. But it's where the big returns will come from in the future." Peltz does his dealmaking through two related companies: Triarc and Trian. (The confusingly similar names derive from Triangle Industries, Peltz's first big acquisition.) Peltz and longtime partner Peter May own 40 percent of Triarc (Charts), which is a publicly traded company with a $1.8 billion market cap. Triarc owns Arby's, the fast-food chain, and an asset-management company called Deerfield Capital (Charts). In November 2005, Peltz, May, and Peltz's son-in-law Ed Garden, a former investment banker, launched Trian, a hedge fund whose investors include university endowments, pension funds and insurance companies. Peltz does not discuss the size of the fund, which returned 37 percent in 2006, but it currently has more than $2 billion in publicly disclosed investments in companies like Wendy's and Chemtura, a chemical products manufacturer. In February, Peltz reported a 5.5 percent, or $320 million, stake in Tiffany (Charts). And in mid-March, Cadbury Schweppes announced that Trian had taken a 3 percent stake in the company, worth about $730 million. A couple of days later Cadbury, in an apparent nod to Peltz and other investors, said it would split itself in two, spinning off its U.S. beverage operations, whose products include Dr. Pepper and Snapple. The stock jumped on the news.